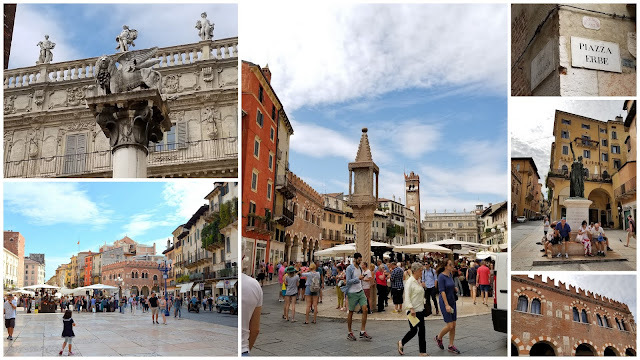 After spending a day in Verona--click here and here to read those posts--my husband and I traveled by train to our next stop, Padua, Italy, the next day. Padua is only an hour away from Venice, and for many centuries it was a rich commune that challenged both Verona and Venice as the seat of power in the Veneto region of Northern Italy before Venice permanently occupied Padua in 1405. It became famous as containing Italy's second oldest university, founded in 1222, where Galileo Galilei was once a lecturer. 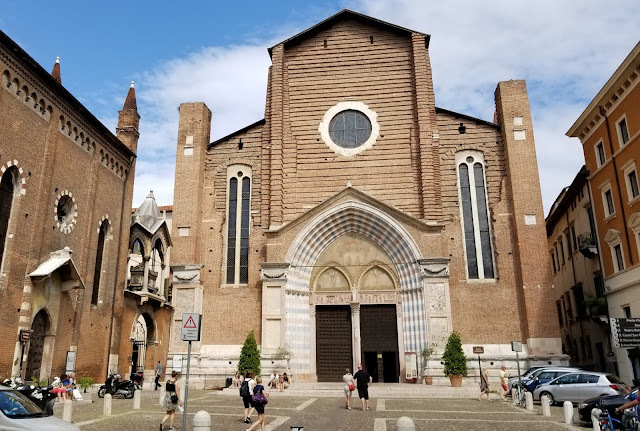 I was nostalgic to return to Padua, as it was another of the cities I visited long ago as a high school student, although the only site we visited was the Basilica of Saint Anthony--more about that in my next post. 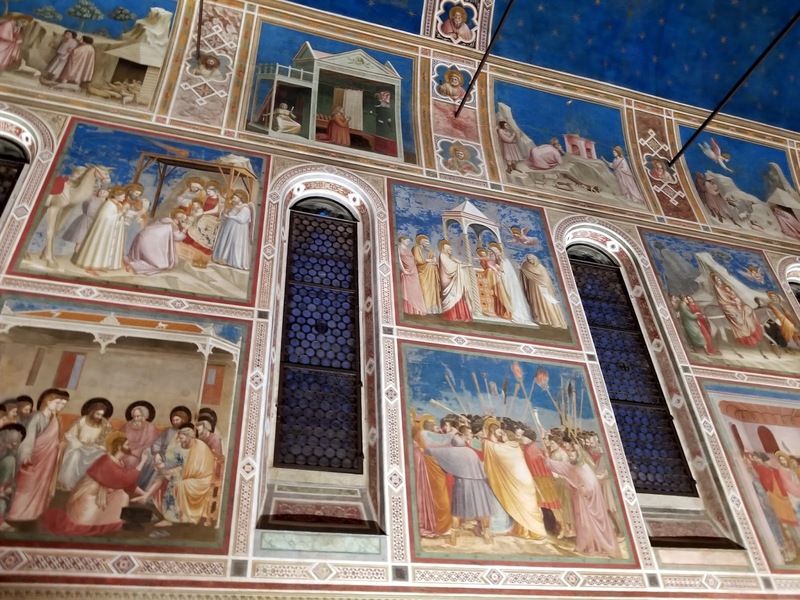 This trip to Padua I was determined to visit the Scrovegni Chapel, which contains religious frescos painted by Giotto di Bondone in 1305, and are considered one of the most important masterpieces of Western Art! 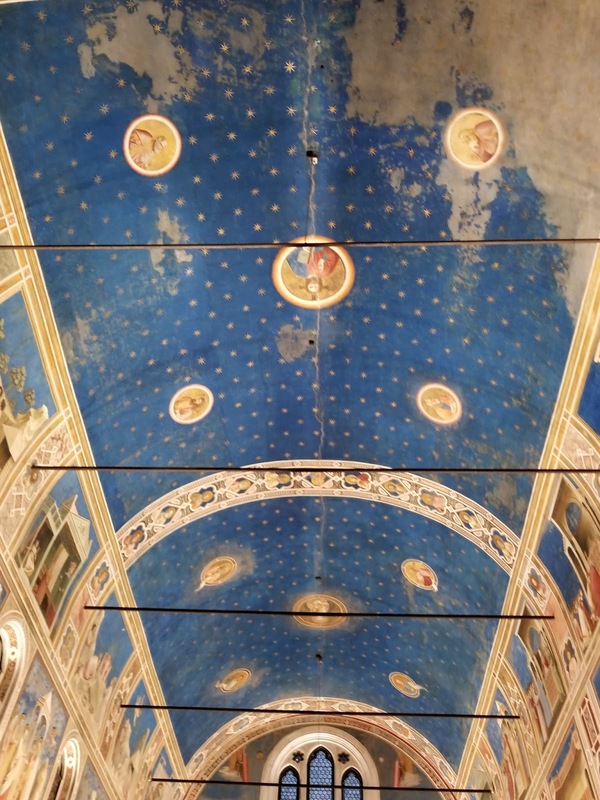 The Scrovegni Chapel is located in Piazza Eremitani, a short walk from the train station. 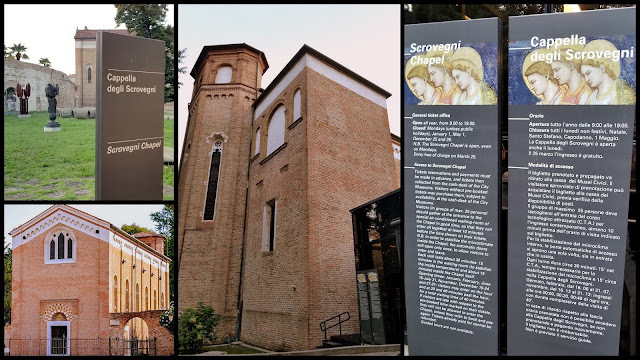 The chapel was originally attached to the Scrovegni family palace, built after 1300, following the outline of the remains of a Roman arena that was located there. 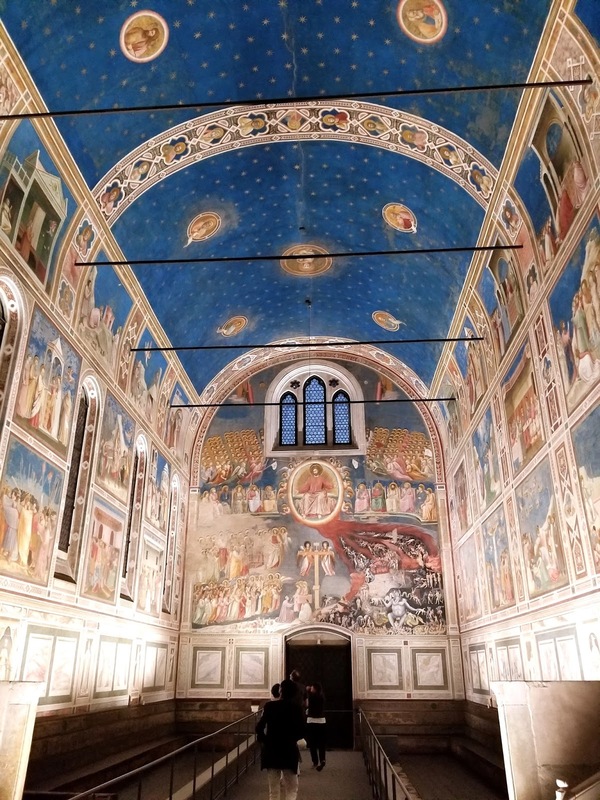 Advance reservation to visit the chapel is mandatory and can be made on the Scrovegni Chapel website, 24 hours in advance. Visits are timed, and only 25 people at a time are admitted. It is required that you stand in an air-conditioned waiting room for 15 minutes so that the microclimate can be stabilized. Then the chapel inner doors are opened quickly to allow everyone inside and closed immediately. 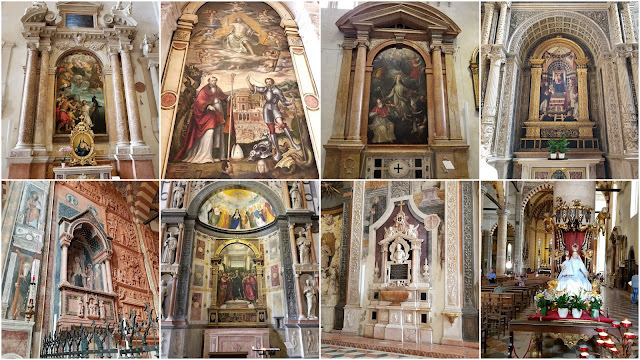 Inside you are allowed 15 minutes to view the frescos. 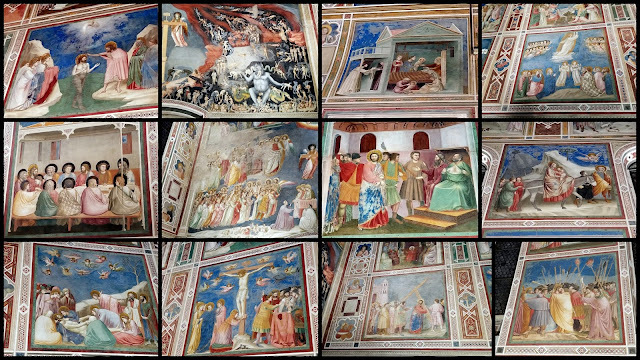 This is all done to preserve the integrity of the frescos from damage. I was not sure I could bring my camera into the chapel, so I left it at our Bed and Breakfast rental. Happily, we were allowed to use our cell phones to take photos and videos as long as the flash was off. Mindful of our time limit, I took the video above quickly when I entered--click here to watch it on my facebook page if you can't see it above. 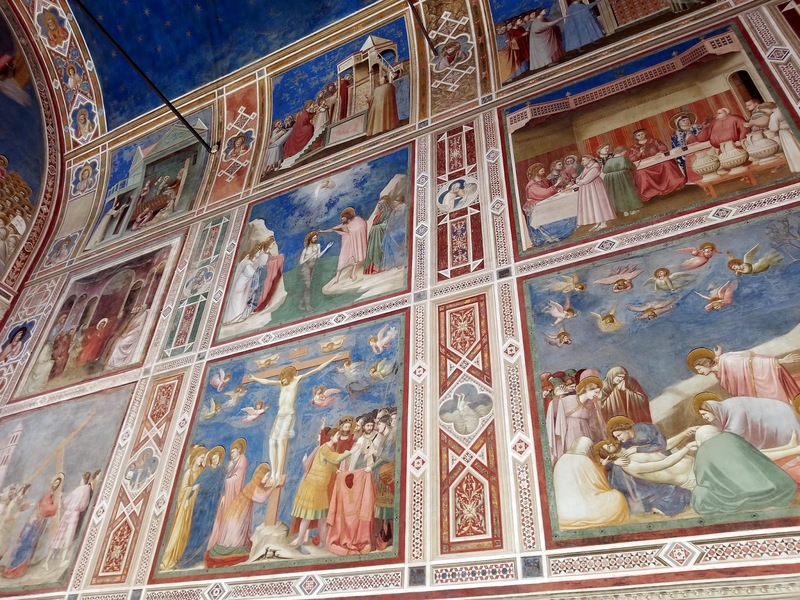 It took Giotto two years to paint the 38 fresco paintings within the chapel. 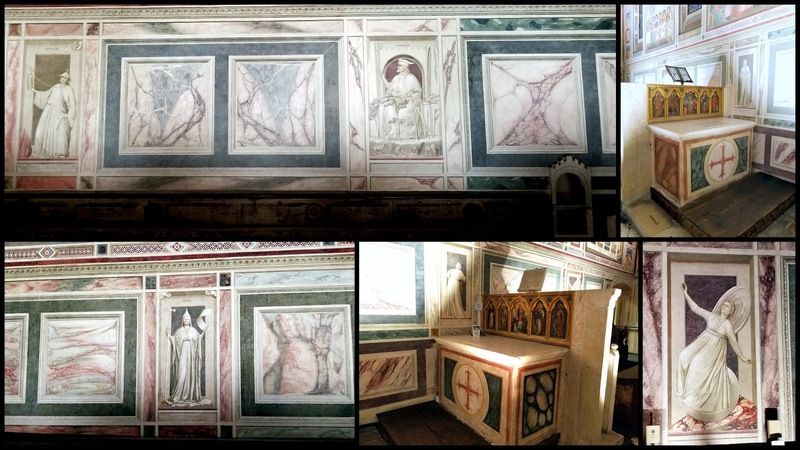 The beauty and colors of the fresco paintings on the chapel walls were exquisite! 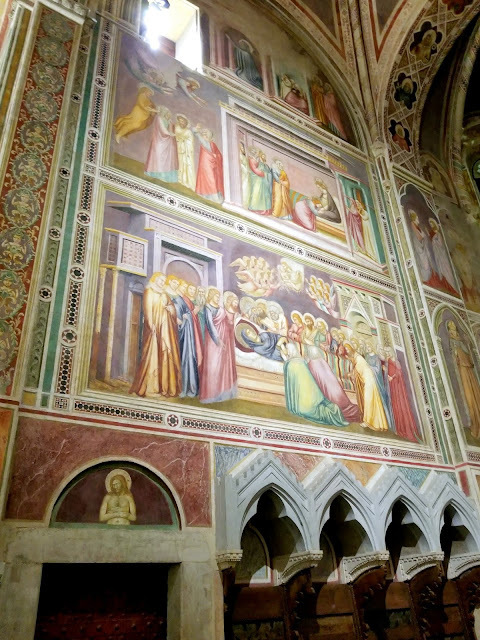 Commissioned to the Tuscan artist by the affluent Paduan banker Enrico Scrovegni in the early 1300s, the frescoes depict the narrative lives of the Virgin Mary and of Jesus Christ. Enrico Scrovegni's tomb, seen above, is also located inside the chapel. 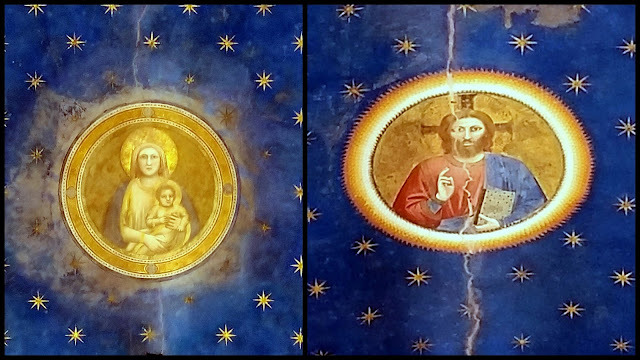 Close-ups of Mary and Jesus that are located on the ceiling. 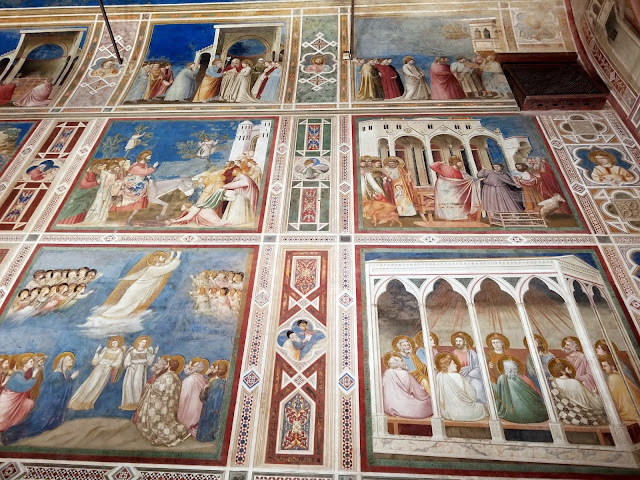 The fresco paintings are considered so significant as the figures they depict are no longer elongated or stylized as in the Byzantine style, they wear clothes that hang naturally, and are three-dimensional in shape. They come alive and tell a story. 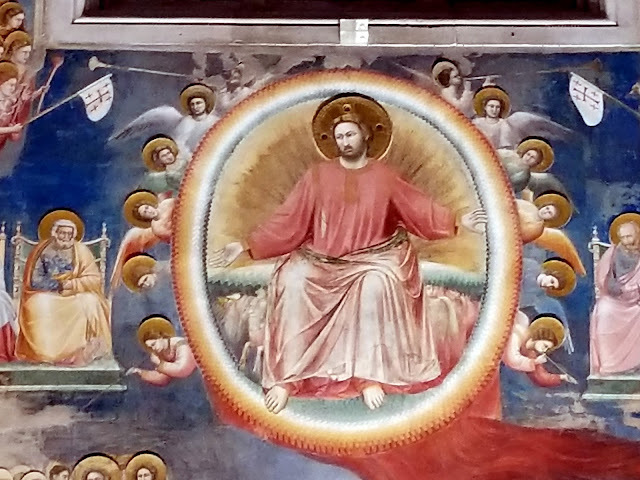 Giotto also made use of perspective, which was not common at the time. 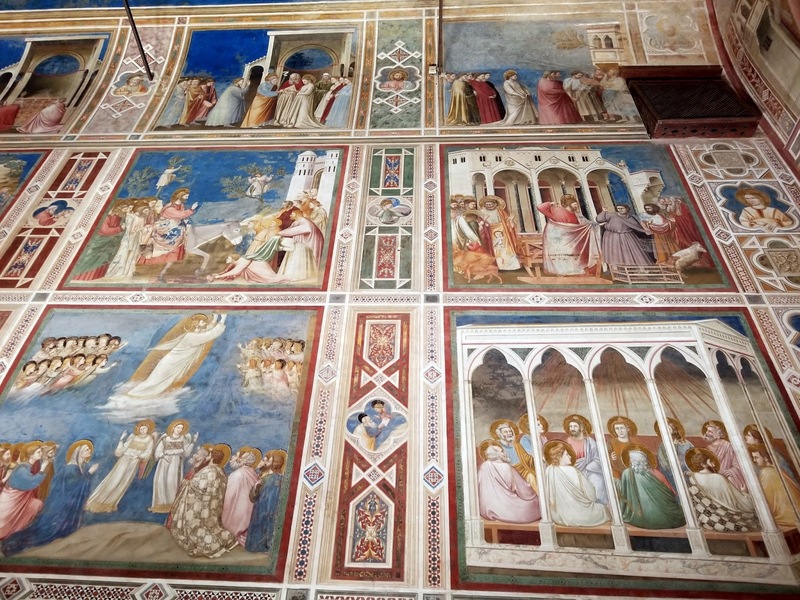 They are considered the precursor to the Renaissance style of art. Around one hundred years after Giotto di Bondone's death, artists of the emerging Renaissance began to seriously study and imitate his work at Scrovegni. 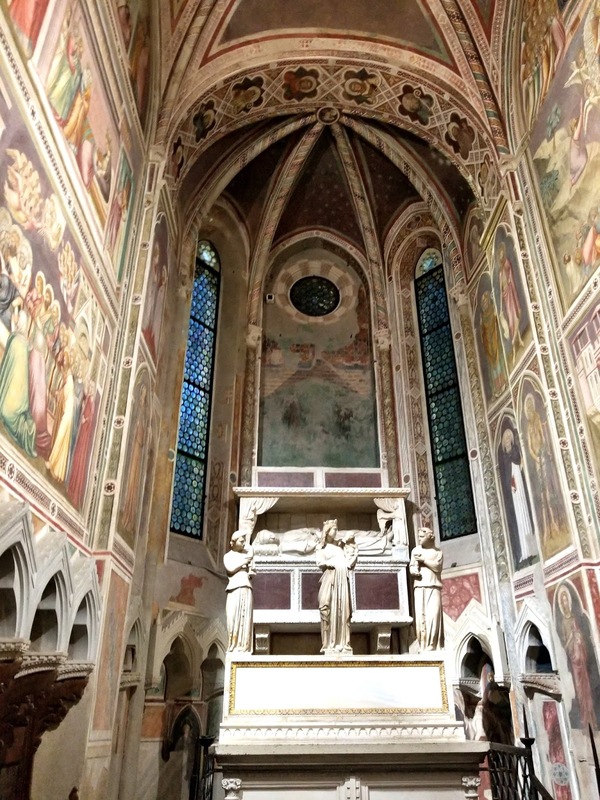 Michelangelo, Leonardo da Vinci, Masaccio and Raphael all visited and studied the chapel at one time or another to learn the techniques of their predecessor. Paintings of Jesus' life were on one side of the chapel. Paintings of Mary's life were depicted on the opposite side. 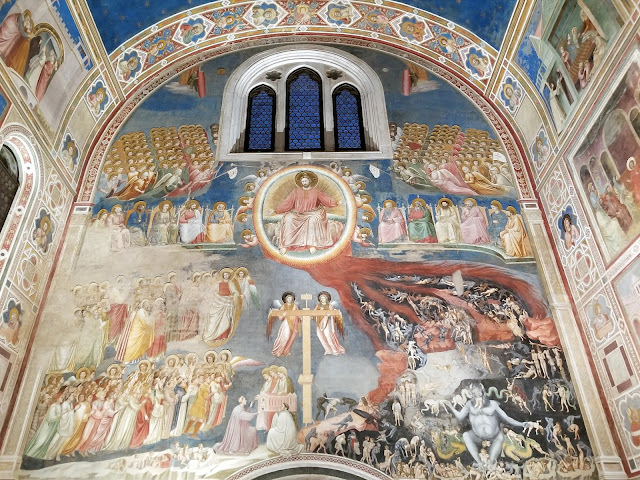 The Last Judgement is depicted above the entrance portal and symbolic representations of virtues and vices adorn the side walls. On the triumphal arch over the altar, you can see God, who instructed the archangel Gabriel to announce the birth of Jesus. The bottom tiers of the longer walls of the chapel feature 14 allegories, in monochrome, symbolizing Vices on the north wall and Virtues on the south wall, along with faux marbling and small altars on either side. 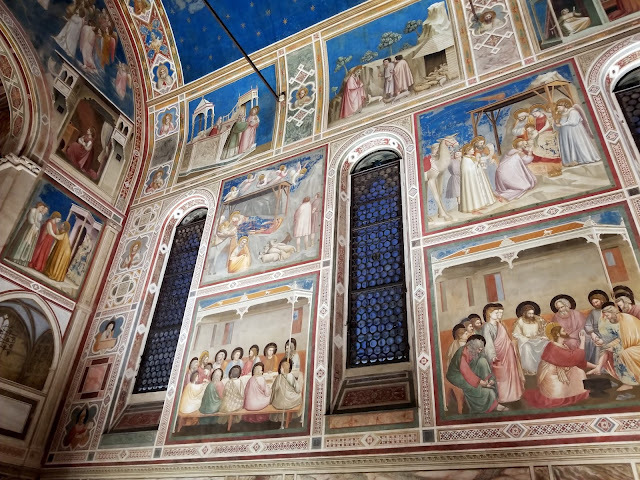 The Scrovegni Chapel has remained a symbol of artistic genius and innovation throughout the centuries and I was thrilled to visit it. 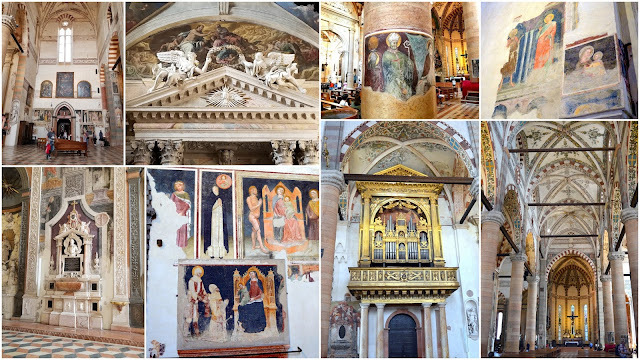 There is much more to see in Padua and in my next post I'll show you more sights from this historic and magnificent city. Beautiful Verona, Italy. It is a city often overlooked by tourists, whose focus is on the cities of Milan or Venice, yet Verona holds many interesting and historical sights and is easily explored in a day or two. Many visitors are interested to explore the sites in Verona made famous by Shakespeare in his play Romeo and Juliet, as I showed in my prior blog post, click here, but there is so much more to see and do. Piazza delle Erbe in Verona is one of the most historical and picturesque city squares in the whole country. Once the site of the Roman Forum, where chariot races were held, it is now the site for the local market. Please remember, all photos and photo collages in this post can be enlarged for easier viewing of details by clicking on the photo. Many stalls and shops line the piazza, as well as cafes and restaurants. The highlight of this square is the Madonna Verona Fountain, which was created by Cansignorio della Scala in 1368. This 14th-century Roman statue is also known as The Virgin of Verona and is actually a Roman statue that dates back to 380 AD. The three-story Palazzo Maffei is also on the square and is famous for its Baroque architecture and facade decorated with statues of Greek gods. 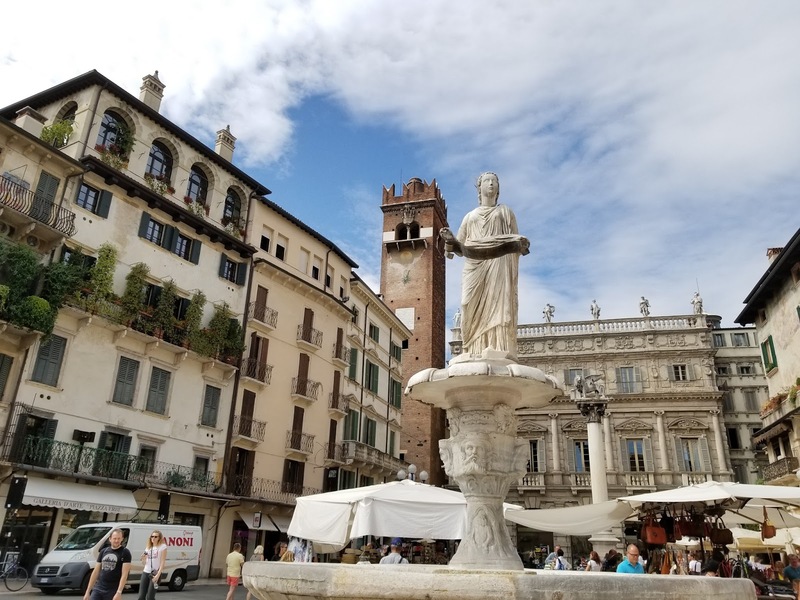 Standing in front of the building is a white marble column topped with a statue of St. Mark's Lion, a symbol of the Republic of Venice which once ruled Verona. 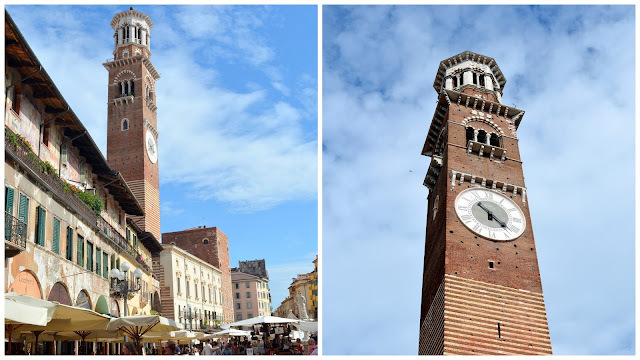 Piazza Erbe is dominated by the tallest of Verona’s towers, the Torre dei Lamberti, built by the powerful Lamberti Family in 1172. Verona in the Middle Ages was a city dotted with tall towers which were a visible symbol of the wealth and power of the noble families which lived in them. 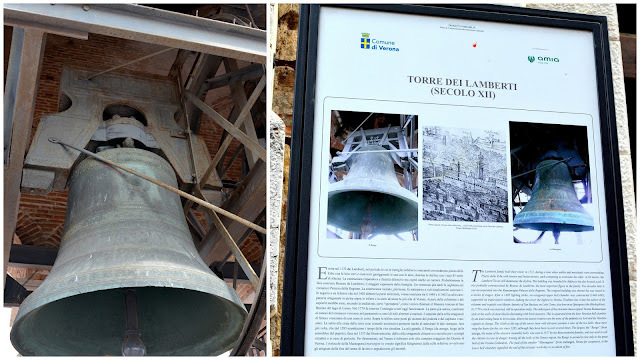 Torre dei Lamberti is a surviving tower to a whole group of towers which rose next to the Palazzo della Ragione and is 276 feet high (84 m). 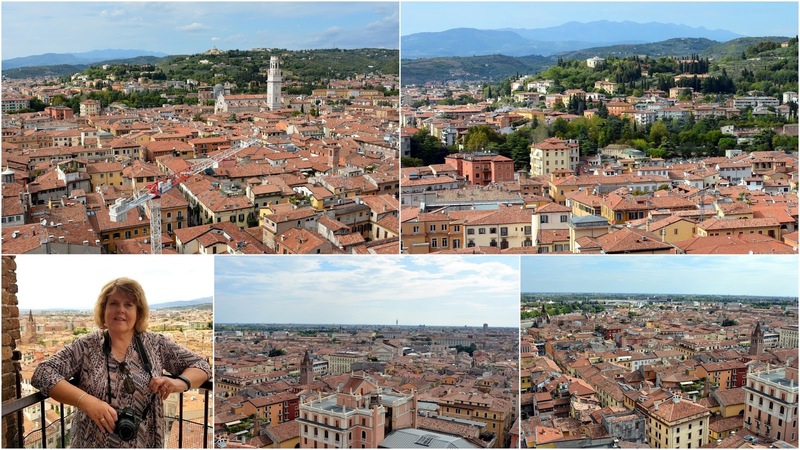 ...where we enjoyed seeing the views of the city of Verona and surrounding area. The tower houses two famous bells at the top, the Rengo, and the Marangona, which kept time and regulated city life. The Marangoni signaled the end of the working day for the artisans and also sounded the alarm in case of fire, whilst the Rengo summoned the Town Council and citizens of Verona in times of war. The bells still ring during funerals. Close to Piazza Erbe are the very ornate Scaliger Family Tombs. 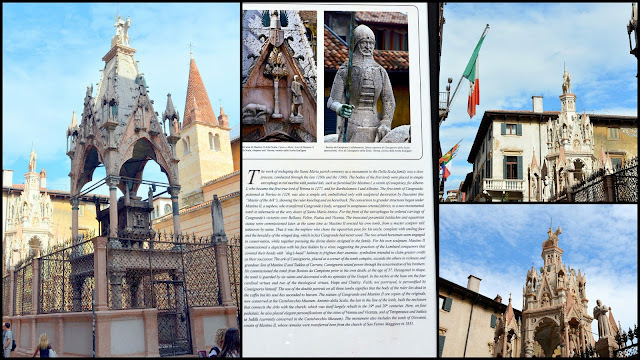 They are a group of five Gothic funerary monuments in Verona, Italy, celebrating the Scaliger family, who ruled in Verona from the 13th to the late 14th century. We visited the nearby Sant’Anastasia Basilica, which is one of Italy’s rare gems built in the Gothic style. It was constructed by the Dominicans from the 13th to the 15th century. The Basilica is famous for its fresco of “Saint George and the Princess of Trebizond” painted by Pisanello, which is located in the Pellegrini Chapel. A true feast for the eyes! The hunchback figurines supporting the two stoups at the base of the first columns of the church’s central nave are also famous. The one seen on the top right of the collage is the work of Gabriele Caliari, eldest son of Paolo Caliari, better known as the Veronese. 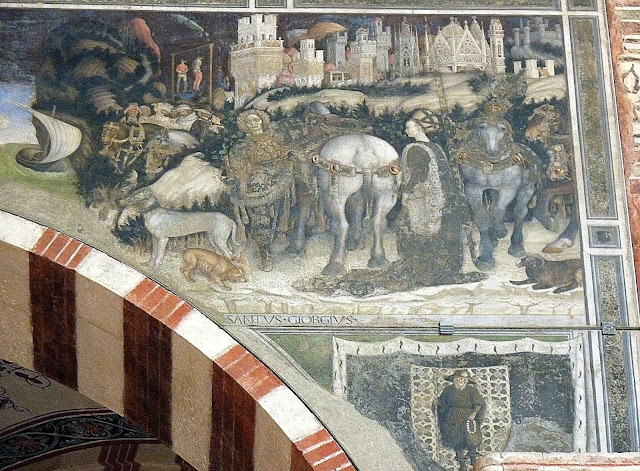 The one in the bottom of the photo collage above is attributed to Paolo Orifice. Both statues symbolize the humility and poverty of the Veronese population. 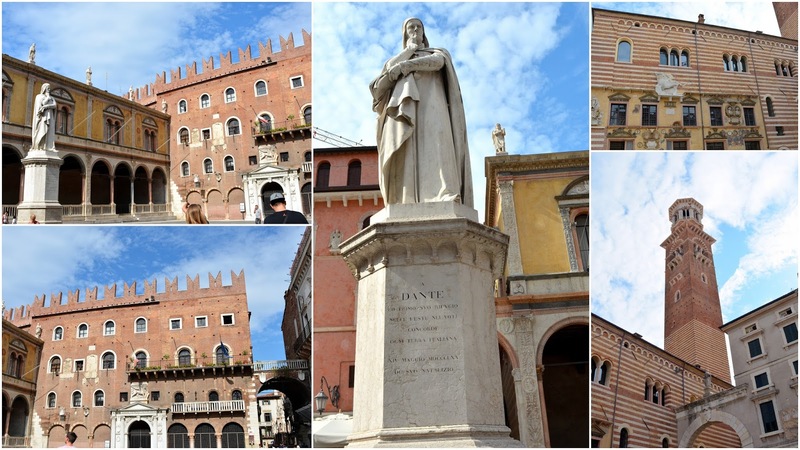 In the Piazza dei Signori stands a statue of the poet Dante Alighieri. 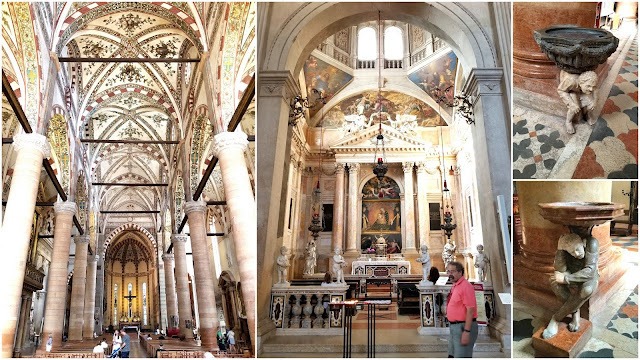 It's the work of Ugo Zannoni and was erected in 1865. Verona was where Dante lived for six years between 1312 and 1318 in Cangrande's residence, editing the Inferno and Purgatorio and working on the final part of the Comedia, Paradiso. 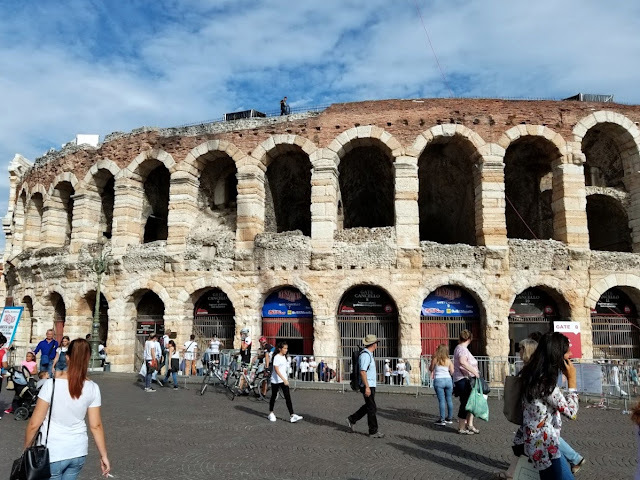 In my last post--click here--I also spoke a little bit about Verona's first century Arena, located next to Piazza Bra. Built by the Roman Empire, it was here where gladiators fought to the death before the eyes of 30,000 spectators. After the Empire fell, the arena became the scene of jousts, tournaments, and trials. 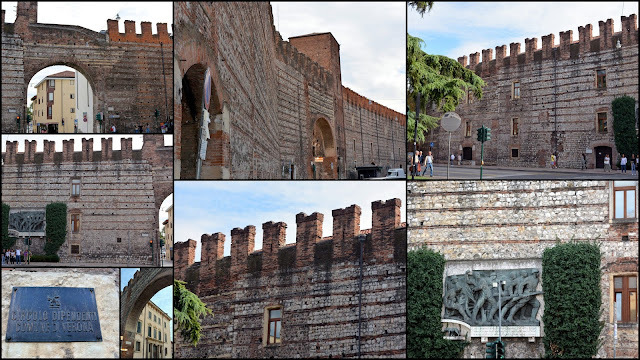 The Verona arena also became a quarry of fallen stones, when earthquakes knocked down many of its surrounding walls. It is still in remarkable shape and now seats 15,000 inside. It is most often used for opera productions, but the day we visited Verona a Music Festival Finale was being televised that evening from the arena, and we were fortunate to receive complimentary tickets to attend it. It was a thrill to walk into the ancient arena that was constructed so long ago. Our seats were one of the cement block rings that lined its inner circular walls, where we had a wonderful view of the stage. 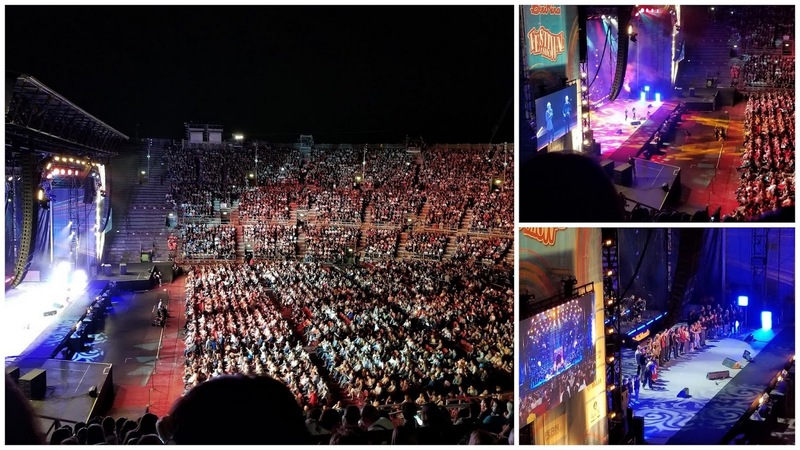 The show began with the finale of a summer-long singing competition, sort of like an American Idol Finale, with three singers that were from Naples, Ragusa, and Milan. Afterward, singers and dancers from around Italy performed. If you'd like to listen to one of the performers singing you can click here to view the video on my Mille Fiori Favoriti Facebook page. Our very full day in Verona had come to a delightful end. The next day we were traveling on to Padua, another exquisite city in the Veneto region. I hope you will join me again to view some of its treasures in my next blog post. 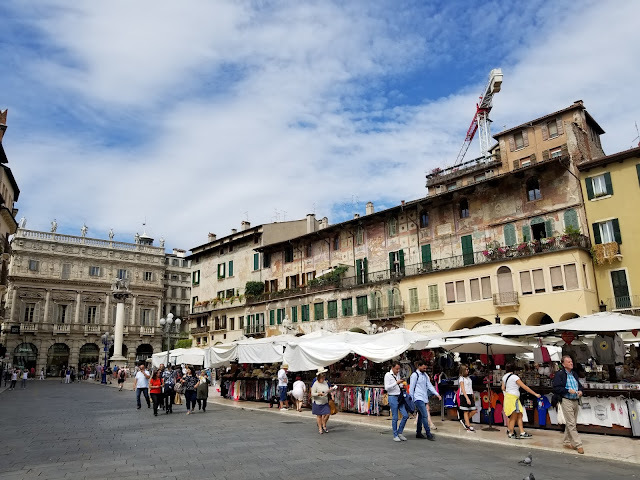 While my husband and I were visiting relatives in Genoa, Italy, last summer we decided to take a few local overnight trips by train. 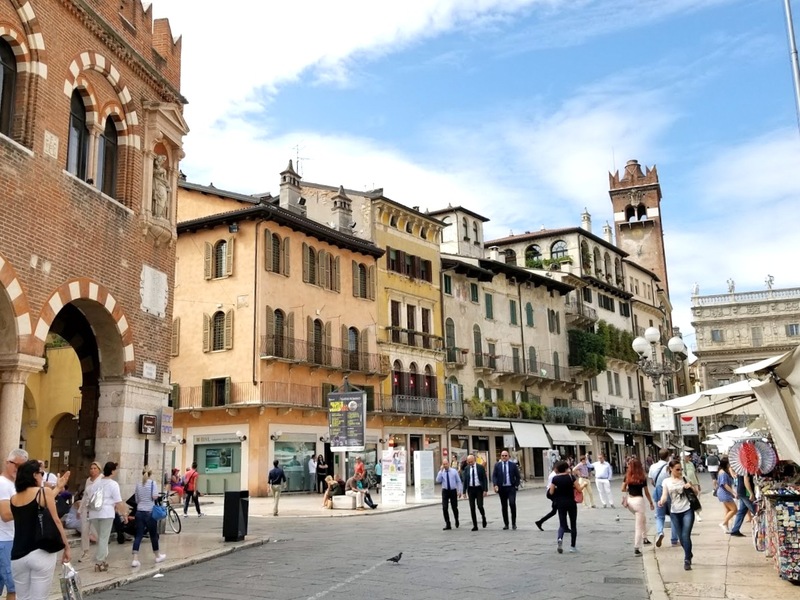 Our first stop was beautiful Verona, located in the Veneto region of Italy. 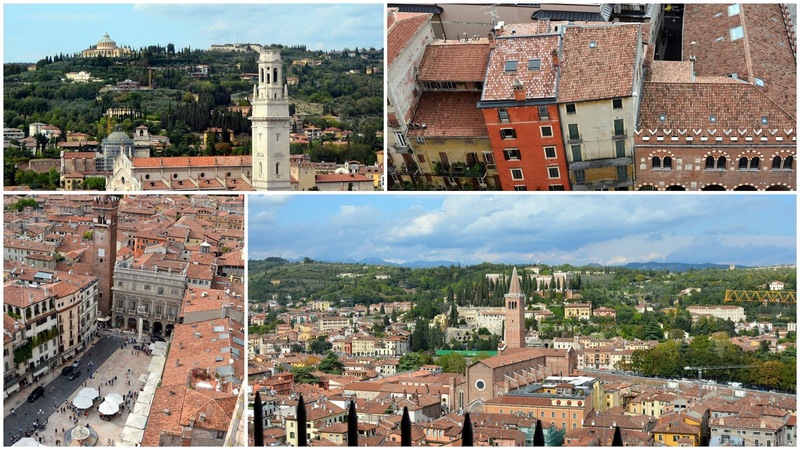 Verona has at its center a medieval old town, called the Centro Storico, that lies between the meandering Adige River. Verona's Arena di Verona is located in the Centro Storico by Piazza Bra. It was built by the Romans in the first century and is still in active use, mainly for opera productions. It is one of the best preserved ancient structures of its kind and once held 30,000 spectators in its confines. In modern times 15,000 people are admitted for performances for security reasons. Unfortunately, we did not visit on an opera day, but we were fortunate to be able to obtain free tickets for a musical event that was taking place later that evening--more about that event in my next blog post. The round façade of the building was originally composed of white and pink limestone from Valpolicella, but a major earthquake in 1117 almost completely destroyed the structure's outer ring, and only a small portion of that decorative ring still stands. It is a marvel to think about the many centuries the arena has been in use and all it has seen! Verona has become famous for being the setting of Shakespeare’s play "Romeo and Juliet," written in 1597. Although the star-crossed lovers are fictional characters, their story has attracted visitors to Verona for centuries. In an effort to satisfy those seeking a place to dream about their legend. 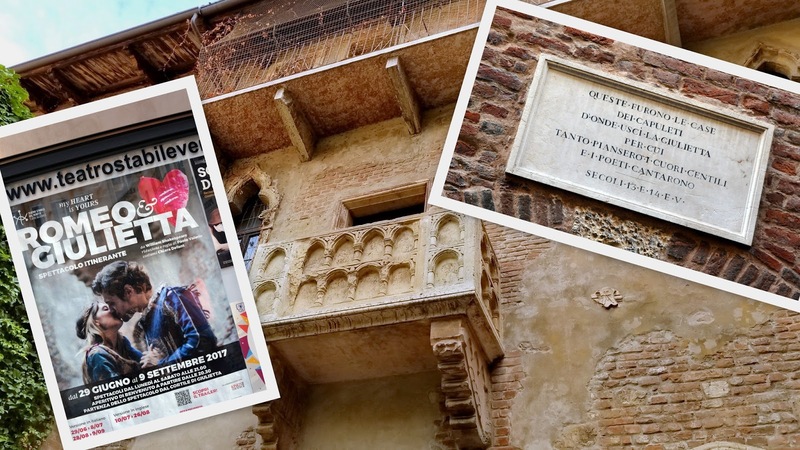 the city of Verona has promoted "Juliet's House" (Casa di Giulietta) and "Juliet's Tomb" (Tomba di Giulietta) as attractions. The house, located along the Via Cappello, at one time belonged to the Dal Capello family, commonly known as the Cappelletti. 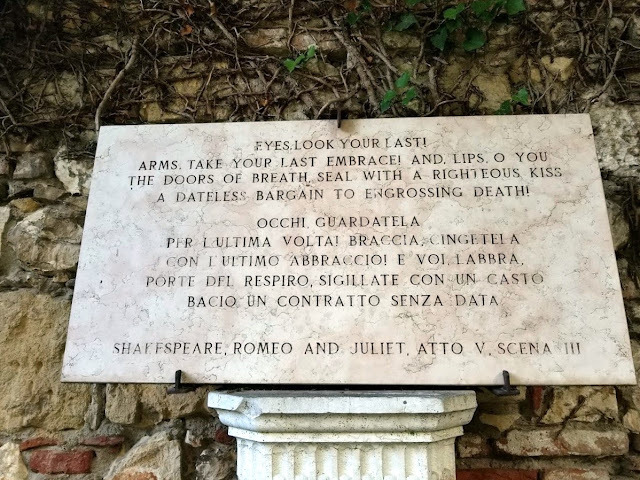 This was so similar to the name of Juliet's family, the Capulets, that the house became her family home in everyone's imagination, even though the balcony was not added until the 20th century! The inscription seen in the collage above lies on top of a corridor that leads to the house's courtyard. It translates as: "This was the house of the Capulets. for whom so many hearts wept and the poets sang." 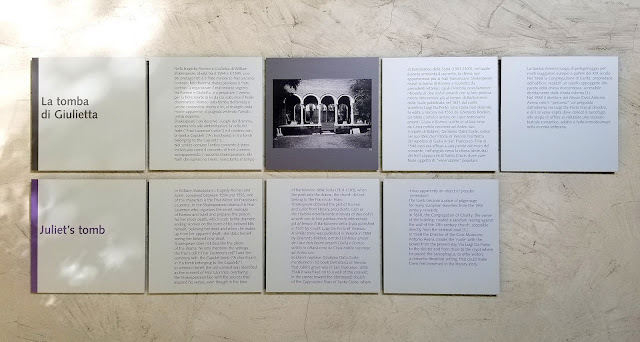 When I visited Verona in the 70's on my high school trip, the Juliet's House courtyard was totally empty and serene--you can read about that experience and see my 1970's photos here. That romantic serenity was nowhere to be found on this visit in the summer of 2017! I was saddened to see it now had almost a circus atmosphere. The walls of the corridor leading into the house courtyard were full of notes and band-aids. proclaiming lost love or the desire for love. The tourist crowds were so thick in the courtyard it was difficult to find a place to stand. Admission to the courtyard is free, but now tours of the house have an admission and many visitors stand on the balcony to have their photos taken. 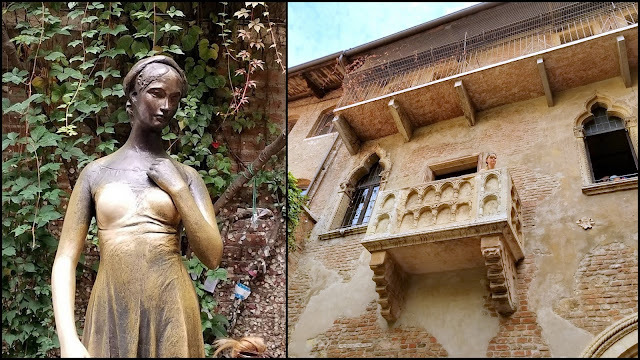 Even the bronze statue of Juliet in the courtyard, sculpted by Nereo Costantini, shows how many tourists reach up to touch and rub her for photos, as the metal is shiny in those areas. It took awhile for me to get a photo of her, and the balcony, without people in it! Even though Julietta's House is definitely an overblown tourist attraction, it was still fun for me to see it again so many years later. 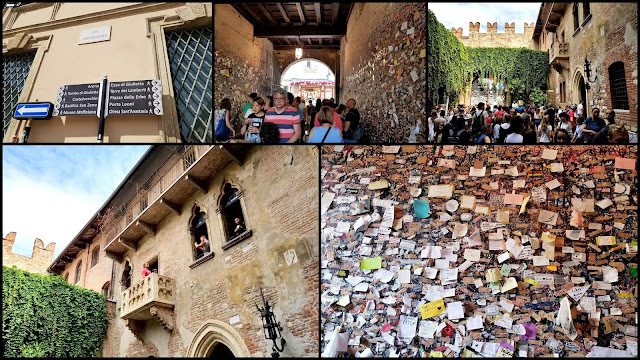 I decided that I should also see "Juliet's Tomb" on this visit to Verona since I did not see it on my first visit to the city. It was quite a walk from the house, but a pleasant one. We had to pass through the walls of the city which themselves were picturesque. 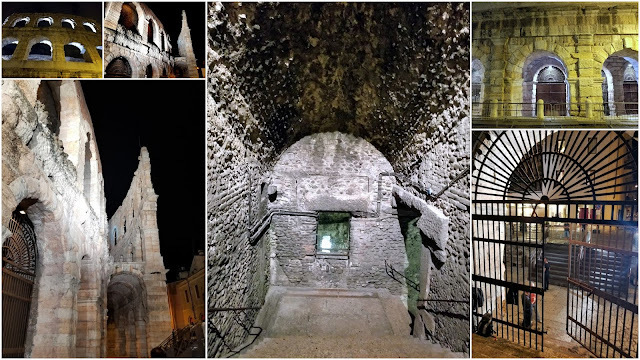 It is inside the former monastery of San Francesco al Corso, located on the Via del Pontiere, which has been indicated as the place where the final events of the Romeo and Juliet tragedy took place. At the end of the thirteenth century, the period in which it is believed that the story might have happened, San Francesco al Corso was the only Franciscan monastery outside Verona city walls. 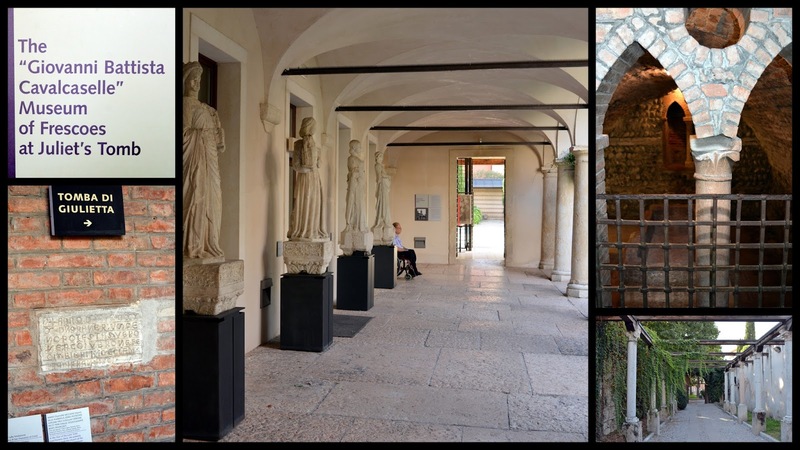 The old monastery has now been transformed into a museum: the Museum of Frescoes G.B. Cavalcaselle. 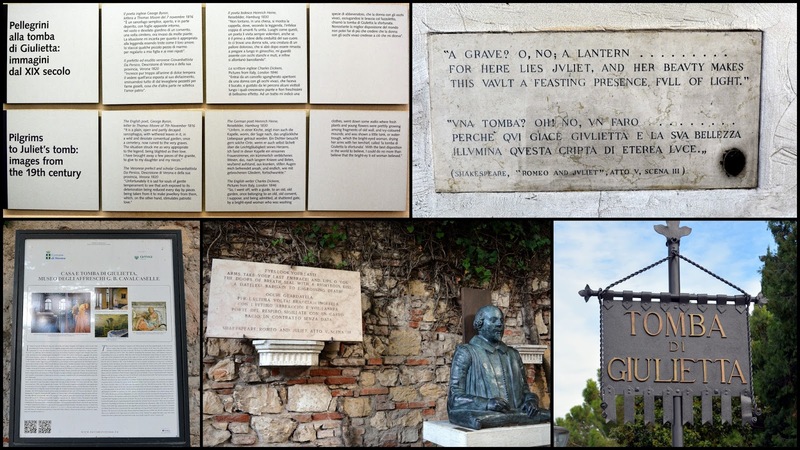 The Romeo and Juliet story is highlighted throughout the museum grounds. In a vaulted room inside the dark crypt under the church of San Francesco al Corso, lays an empty, simple sarcophagus made of red Verona marble. It is believed to be Juliet's grave. Thankfully, the room in which the sarcophagus rests was empty and solemn, and it was easy in this environment to imagine the story of the star-crossed lovers being true. The underground room also contains tombstones on the floor where monks were buried centuries ago. Please click on to enlarge to read. 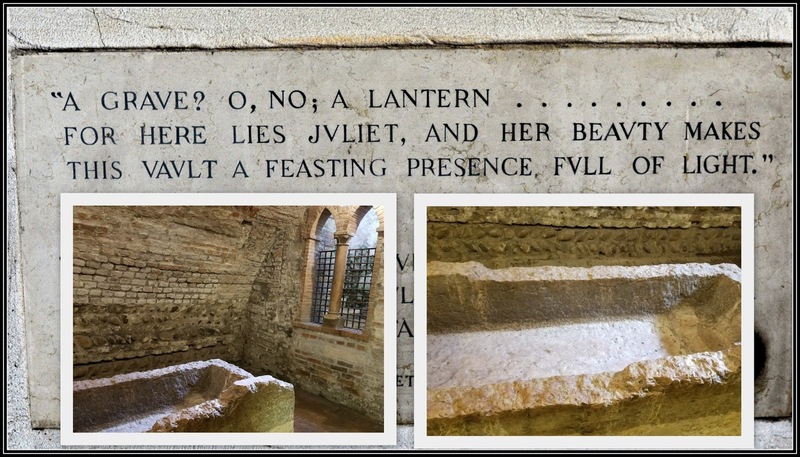 The museum's explanation placard in the photo above as to how this tomb became associated with Juliet. Beautiful Verona, as well as other Italian locations, were much a part of Shakespeare imagination. 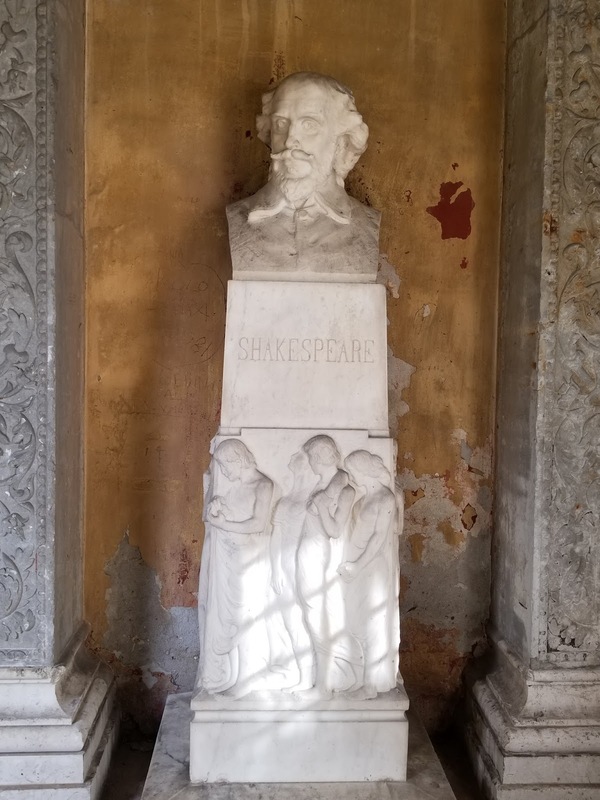 A third of his plays take place wholly or partially in Italy. There is much speculation as to why he used Italy as a location, but I'd like to think that it was a fascination with a country that had a rich and passionate history as well as monumental beauty and allure. 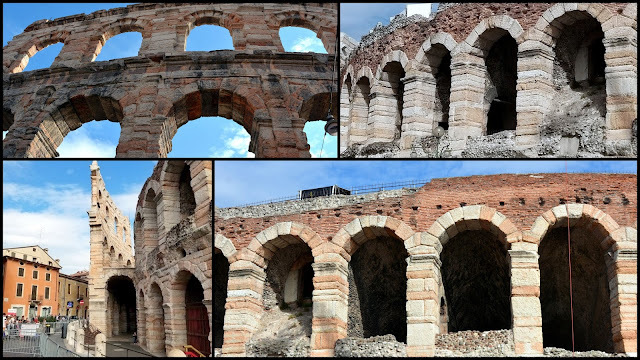 In my next blog post, I'll show more sights in Verona, as well as the special event we attended in the Verona Arena. There is much more to see!